Many a Christmas dinner, we end up with the potatoes falling apart in the dish and pale olive-green Brussel sprouts. Does it have to be like this? Using a little scientific knowledge in the kitchen can help. 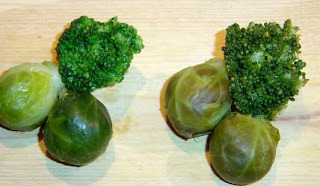 Brussels sprouts and the broccoli: Do you prefer a fresh, vivid green colour, or a dull olive green? The colour in green vegetables is due to chlorophyll, which is a compound well suited to play around with. The green colour in chlorophyll is due to a magnesium atom (in fact, an ion) attached to a porphyrin ring, and acid can substitute this magnesium altering the colour. Try adding a little lemon juice or vinegar to the water next time you cook green vegetables if you want to do a “sabotage experiment” just to see what you may want to avoid. This kind of sabotage experiments are, in my opinion, just as important as the “successful” ones. Fruit and vegetables contain a little acid, so if we use pure water or steam the, this acid is in fact sufficient to alter the colour in a negative way. As a remedy, try adding a couple of teaspoons of (sodium) bicarbonate/natron per litre of water. This makes the water slightly basic. The water will turn green as well, but there is more than enough chlorophyl left for the vegetables. Short cooking times is also recommended, as chemical reactions take time, and the replacement of magnesium is no exception. This is probably the reason that the colour change is more visible in Brussels sprouts than broccoli, the sprouts cook longer and thus more of the chlorophyll is degraded. So, in the two posts conclusion: treat the potatoes and vegetables the opposite way. 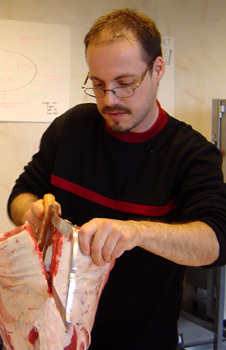 McGee, H. (2004): McGee on Food and Cooking – An Encyclopedia of Kitchen Science, History and Culture. London: Hodder and Stoughton. Belitz, Grosch og Schieberle (2004): Food Chemistry (3. utg.). Berlin: Springer. PS: have any idea why the water turns green on adding bicarbonate? Please let me know. The water turns green because chorophyll A looses it's "fatty tail", thereby becoming water soluble. This loss is catalyzed either by acid, base or an enzyme called chlorophyllase. I thought so as well. The problem is that I can't see this happening when I use acidic water. Why? Is there something about further protonation of the porphyrin ring giving a positively charged molecule that retards the cleavage, or is it in the enzyme? Any info on different reactivity of chlorophyllase in acidic vs basic media? I'll have a look myself. You may want to take a look at this paper "Effect of pH on chlorophyll degradation and colour loss in blanched green peas"
thanks a lot for this tip. It seems to be highly relevant, and I'll have a very close look at this and whatever threads there may be to follow in the citations.